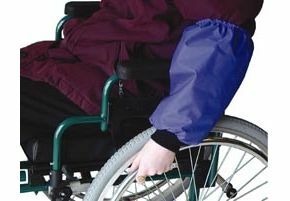 Wheelchair Clothing Sleeve Protectors (Pairs). These half sleeves are to be worn when propelling your wheelchair. The cuffed bottom and elasticated top hold them in place, preventing whatever your wheels pass through, rubbing on your clothes, saving them from dirt and abrasion. Available in one size and in pairs. Kept my coat arms clean & dry. Just what I wanted. We received the package quickly and the sleeve protectors have proven themselves already. A great product and very high quality construction. We will be ordering other products in future, thanks again.